We have added a discounted gear section on our store front. 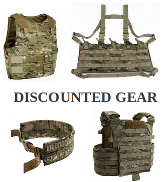 The discounted tactical gear is all brand new gear – over runs, extras or color mix match. Each item has a product description and quantity. Click on the Discounted Gear link to see what is currently available. If you have questions about the discounted gear please send us an email before purchase. We have released our newest carrier. The BALCS LVR (Low Vis Rig). Built around the popular and readily available BALCS cut body armor. The scalable low profile system can be worn over or under clothing.The interchangeable load carriage systems can be attached depending on the mission. We had the opportunity to check out La Gran Fuerzas Armadas de México (The Mexican Armed Services and SEDENA (The Mexican Secretariat of National Defense).